Well, the big news for today is that it isn’t raining – yet. Today, Jackie wanted to clean and dust. The Dog likes nothing better than to get into a argument with the vacuum cleaner. Dog and vacuum and furniture makes cleaning complex, so The Dog and I went out for a walk while all that was going on. It was a dull, grey day but that nasty cold wind had taken the day off and temperature-wise is was quite pleasant. On the way back, as we passed the big pine trees that grow up the back of our hill an agitated guttural bird call drew our attention upwards. Whoever it was, was quite high in the ivy covered tree and it took a while to pinpoint the source of the noise, I certainly wouldn’t call it bird song. With a quick point and click we snapped a few photos. Not sure if we had actually been pointing the camera in the right direction, but not wanting to prolong whoever’s agitation we carried on home. 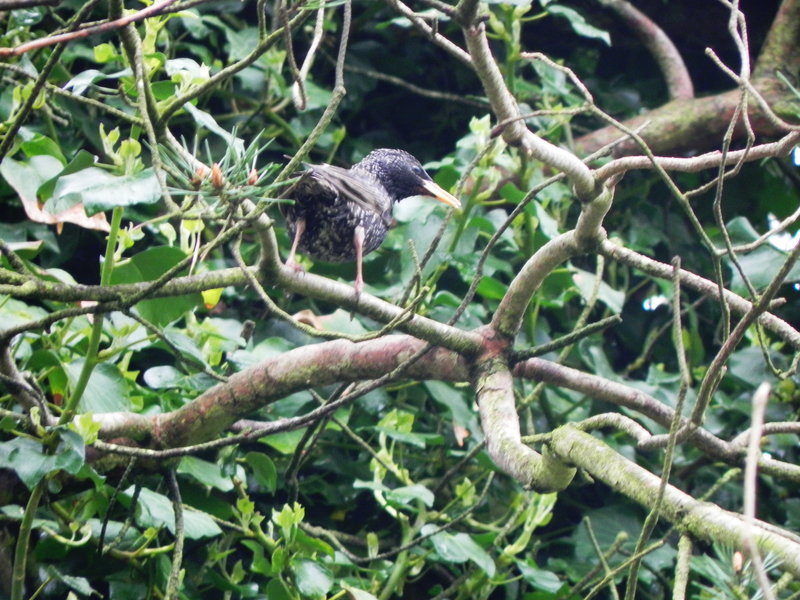 And here’s the picture, a starling. Quite a surprise, we hardly ever see starlings around here. According to the RSPB, they have been having a tough time lately and have needed to go on the Red List of birds needing a little extra TLC. Starlings are good mimics, and people who are interested in how humans first learnt to speak have been studying what the birds mimic and why, to see if they can pick up a few hints.